Flashback episode! I like flashback episodes. In fact this is a flashback within a flashback, opening in 1990 and then taking us to 1952, revealing that Mulder's father was involved in one of the earliest X-Files. The episode was made in 1998 and the framing device is set in 1990 so in the scenes featuring Mulder, it can't revel in period detail in the way some do (Fringe's episodes set in the 1980s are a particular delight in that respect) but I do love Mulder's huge 1990 reading glasses. He also smokes. He was such a young bad boy. Most of the episode is set in the 1950s, though, which is another thing all together of course. The suits and hats are a particular joy. They knew how to make suits and hats in the 1950s. And the cars! Not too many muscle cars on display (I love 1950s and 1960s American muscle cars) but some gorgeous town cars. The 1950s is, of course, a perfect setting for a story about government conspiracies, set against the McCarthy hearings and featuring wonderful images like the file presented to a young Arthur Dales with all but half a dozen words blacked out. And it's much easier to prevent anyone from exposing your secrets when there's no Internet and you can threaten them with a McCarthy hearing if they make a fuss. We even get a cameo from J Edgar Hoover (creepy and unpleasant as ever). 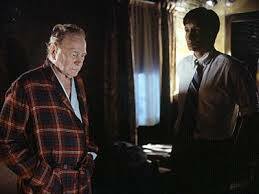 Mulder's passionate desire to uncover and expose 'the truth' clearly runs in the family, but unfortunately, Mulder Sr was faced with the threat of being accused of being a Communist, and ended up getting involved in the conspiracy himself. What Mulder Jr doesn't know, though, is that Bill Mulder helped Ed Skur to escape in the hope that the truth would someday be revealed. Whereas the son battles everyone and has made a name for himself as a rebel, the father tried to do what he could from the inside. (Neither tactic appears to be having much success so far). One of the other fun things about this episode is seeing a young Mulder who knows hardly anything about the X-Files during the framing sequences. We've already seen something of this Mulder in 'Unusual Suspects,' but here we see him more seriously starting to explore some of what the government has been covering up and how it relates to his family in particular, and starting to realise just how deep his father's involvement goes. The conspiracy storyline in this episode is nothing particularly new or shocking for The X-Files – Nazi medical experiments, government cover-ups, weird science, the usual. But the period setting is fun and flashbacks are always a nice change of pace. - No Scully in this episode, as Gillian Anderson was filming scenes for the movie. Sadface. - As in 'Unusual Suspects,' Mulder wears a wedding ring in the scenes set in 1990. - 'Arthur Dales' was a pseudonym used by blacklisted screenwriter Howard Dimsdale in the 1950s. Dorothy Bahnsen: Unsolved cases. We file them under X.
Dales: Why don't you file them under U for Unsolved? Bahnsen: That's what I did until I ran out of room. Final Analysis: Lovely setting and some intriguing background on the Mulder family. Two and a half out of four almost entirely blacked out FBI files. Thanks for the review Juliette and I agree that flashbacks are great but I don't have your grasp of X-files continuity so I was surprised by both the smoking and the wedding ring. 'Xenotransplantation' is something I don't really want to know about and that creature certainly looked like it was from out of this world. So did the Nazis find those nasty things or build them? Oh yes, and if we have to do things that our enemies are ashamed of, why exactly is it a good thing if we win? I like this episode as well as I like flashbacks as well. The framing device works well and, as you point out, I like the continuity of the wedding ring and the smoking. Your review is great. I loved this one -- it's worked much better for me in later rewatches because it stands on its own accord very very well. I think the sophistication was lost on my 20 year-old self who only had eyes for M&S. :) Love Garret Dillahunt here too.